$139.75 for set of 5 cups (Out of stock). 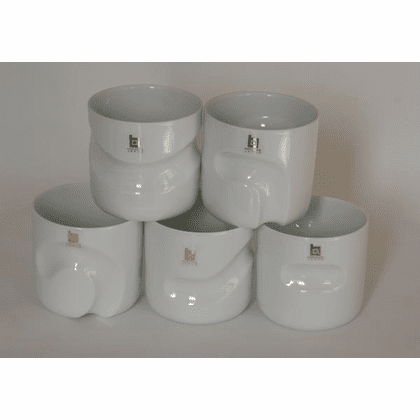 Five different design white Hakusan cups, 2-3/4 inches tall, 3 inches in diameter. Indentations provide a nice space to grip cup for thumb and index fingers. Designed by Masahiro Mori. Picture shows item numbers from top left to right #300435 (Out of stock), #300436, bottom row left to right #300437, #300438, and #300439.